A recent market study published by the company – “Treponema Pallidum Tests Market: Global Industry Analysis 2013 – 2017 and Forecast 2018 – 2026,” consists of a comprehensive assessment of the most important market dynamics. By conducting a thorough research on the historical as well as current growth parameters of the treponema pallidum tests market, the growth prospects of the market are obtained with maximum precision. The report features unique and salient factors that may have a huge impact on the development of the treponema pallidum tests market during the forecast period. It can help the players to modify their manufacturing and marketing strategies to envisage maximum growth in the treponema pallidum tests in the upcoming years. The report provides detailed information about the current and future growth prospects of the treponema pallidum tests market in the most comprehensive way for better understanding of the readers. 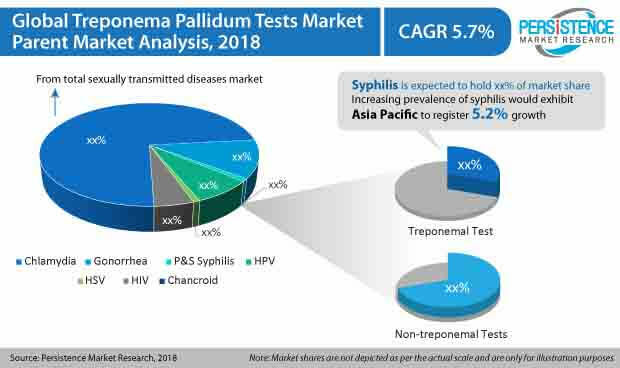 The report commences with the executive summary of the treponema pallidum tests market, which includes the summary of key findings and statistics of the market. It also includes the market value (US$ million) estimates of the leading segments of the treponema pallidum tests market. Readers can find detailed taxonomy and the definition of treponema pallidum tests in this chapter, which will help them understand the basic information about the treponema pallidum tests market dynamics, disease epidemiology of syphilis and pricing analysis included in the report. This chapter includes a detailed analysis of the growth of the North America treponema pallidum tests market along with a country-wise assessment including the U.S. and Canada. Readers can also find regional trends, and market growth based on test type, service provider, and country for the treponema pallidum tests market in North America. The readers can find detailed information about factors that are impacting the growth of the Latin America treponema pallidum tests market. This chapter also includes the growth prospects of the treponema pallidum tests market in leading LATAM countries such as Brazil, Mexico, and Rest of Latin America. Important growth prospects of the treponema pallidum tests market based on its test types, along with service provider in several European countries, such as EU4, the U.K., and Rest of Europe. Greater China, India, Japan, ASEAN, Australia, and New Zealand are the leading countries in the APAC region that are the prime subjects of assessment to obtain growth prospects of the APAC treponema pallidum tests market in this chapter. The readers can find thorough information about the growth parameters of the APAC treponema pallidum tests market during the period 2018-2026. This chapter provides information on how the treponema pallidum tests market will grow in the major countries of the MEA region, such as GCC Countries, Turkey, Iran, Israel, and South Africa, during the period 2018-2026. This chapter explains how the treponema pallidum tests market will grow across various geographic regions, such as North America, Latin America, Europe, Asia-Pacific, and Middle East & Africa (MEA). Based on the Test type, the treponema pallidum tests market is segmented into treponemal test and non-treponemal tests. In this chapter, readers can find information about the key trends and developments in the treponema pallidum tests market and market attractive analysis based on the type of tests. Based on the service provider, the treponema pallidum tests market is segmented into hospitals, specialty clinics, ambulatory surgical centers, diagnostic laboratories and academic & research institutes. In this chapter, the readers can find information about the key trends and developments in the treponema pallidum tests market and market attractive analysis based on service provider. This chapter helps readers to understand the research methodology followed to obtain various conclusions, important qualitative information, and quantitative information about the treponema pallidum tests market. Several new techniques and approaches have been developed over the years to achieve laboratory culture of T. pallidum and to determine properties related to its metabolism and gene expression. This has allowed for the culturing of the etiological agent i.e. Treponema pallidum. Syphilis is mainly diagnosed through serological testing, which is the most frequently used approach in the laboratory diagnosis of syphilis. A combination of treponemal and non-treponemal diagnostic tests is used to diagnose active syphilis. To detect antibodies to T. pallidum proteins, treponema pallidum tests, such as treponema pallidum particle agglutination assay (TP-PA) test and treponema pallidum hemagglutination Assay (TPHA), etc., are commonly used. Non-treponema pallidum tests detect antibodies directed against lipid antigens, possibly from treponema and damaged host cells. Non-treponema pallidum tests, such as Venereal disease research laboratory (VDRL) test, Rapid plasma reagin (RPR) test, Toluidine red unheated serum test (TRUST) etc., are widely performed to determine the positivity of a disease. The easy availability of various confirmatory diagnostics treponema pallidum tests for detecting the presence of syphilis is expected to fuel the global treponemal pallidum tests market over the forecast period. Sexually transmitted diseases, such as syphilis, still remain a taboo. This is partly due to lack of knowledge about such diseases. Although there is wide availability of various treatment and diagnostic options in the market for the screening of treponema pallidum, factors, such as social pressure & myths related to STDs, become a major restraint during the treatment procedure. This is especially so in underdeveloped regions where people affected by sexually transmitted diseases, such as syphilis, do not go for screening and treatment procedures to avoid social stigma. Due to this particular factor, several people are left untreated and undiagnosed in several parts of world. This is a major factor expected to deter the growth of the treponema pallidum tests market during the forecast period. Treponema pallidum tests detect the presence of syphilis through antibody tests, which are expensive and are required to be performed frequently, i.e. once in every 3 to 6 months if the individual has acquired a sexually transmitted disease. Moreover, the patient may or may not show any signs of syphilis for several weeks due to the absence of any antibodies or the presence of only a few antibodies, which may lead to false results. Thus, the high cost associated with treponema pallidum tests is a limiting factor restraining the growth of the treponema pallidum tests market. Clinicians use multiple sources of information for making a diagnosis. For instance, they use information from various risk assessments, multiple serologic tests, physical examination, medical history of previous syphilis test results and treatment and any history of recently infected partners. More recently, an increasing number of institutions and laboratories have been moving away from traditional syphilis testing algorithms (initial screening with non-treponemal pallidum tests) and towards reverse algorithms (initial screening with treponema pallidum tests). According to research studies, reverse screening algorithm identifies more patients with syphilis that the traditional screening algorithm. According to the CDC, many laboratories are adopting reverse sequence screening to permit high throughput treponema pallidum tests and reduce time and labor required for syphilis screening. Reverse algorithm also identifies past infections, which might go undetected using the traditional algorithm. Reverse screening also offers a number of other advantages, such as automated screening on a high-throughput treponema pallidum testing platform and specific screening assay. Furthermore, reverse screening algorithm detects more cases of early or latent syphilis compared to the traditional screening algorithm. Thus, this particular advancement is expected to boost the growth of the treponema pallidum tests market. Treponema pallidum is a causative agent of syphilis. Treponema pallidum is a motile spirochete organism of genus T. Syphilis commonly spreads through sexual activity. Treponema pallidum enters the host body by rupturing the squamous epithelial tissue. Primary syphilis is marked by inflammation and ulceration in genital areas. Further progression of syphilis leads to maculopapular rashes and damages to the central nervous system. Syphilis is screened with various diagnostic treponema pallidum tests, some treponema pallidum tests check for the antibody produced by the bacterium and others treponema pallidum tests check for the genetic material of the etiological agent. The serological tests most commonly performed to screen syphilis are non-treponemal and treponemal pallidum tests. The report on the treponema pallidum tests market offers a comprehensive evaluation of the business opportunities in the treponema pallidum tests market along with insights on the treponema pallidum tests competition blueprint, pricing analysis of the treponema pallidum tests market, list of service providers in the treponema pallidum tests market and epidemiology study of the treponema pallidum tests market for the duration from 2018 to 2026. The report offers a comprehensive taxonomy of the treponema pallidum tests market on the basis of treponema pallidum tests type, service providers of treponema pallidum tests and region. On the basis of treponema pallidum tests type, the global treponema pallidum tests market has been segmented into treponemal tests and non-treponemal tests. On the basis of treponema pallidum tests service provider, the global treponema pallidum tests market has been segmented into hospitals, ambulatory surgical centers, specialty clinics, diagnostic laboratories and academic & research institutes. From a geographical perspective, the treponema pallidum tests market has been segmented into North America, Latin America, Europe, Asia Pacific (APAC), and Middle East & Africa (MEA). What is the revenue potential of the treponema pallidum tests market across emerging economies? What are the factors driving the growth of the treponema pallidum tests market across the world? What are the major challenges influencing the growth of the treponema pallidum tests market?